SHOP.CA opened its doors a couple months ago and I’ve been making my shopping wish list via my Pinterest board. I have a lot of “wants” like DVDs for my movie collection, but what I ended up buying for my very first purchase was something practical and what I would consider both a “want” and a “need”. 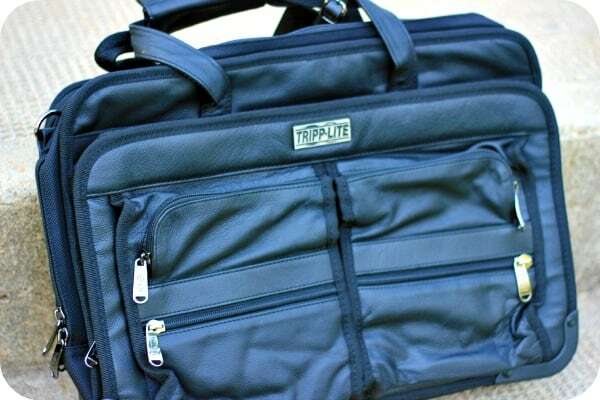 The first item I bought on SHOP.CA was the Notebook/Laptop Case from Tripp Lite! Isn’t it a beauty? On my last couple trips, I left my laptop at home because I was too nervous to travel with it. I’m paranoid about it getting damaged on the flight if there was some turbulence. I NEED to bring my computer with me when I travel especially to the USA since its so expensive to surf the net and check emails on my iPhone. Roaming charges are killer! I have a press trip to Los Angeles coming up in a few weeks and then I’m headed to Las Vegas in October and my laptop needs to come with me this time. I felt so lost without the last couple times I left it at home. The Tripp Lite Corporate Top-Load Notebook Case not only has a sleek, professional look, but it’s also very functional and durable. It’s made of genuine leather and rugged 1682 denier nylon which makes it sturdy. I love how roomy it is. 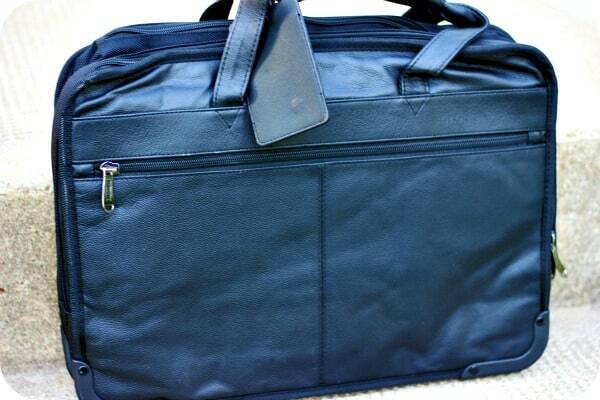 It even fits John’s ginormous laptop that would never fit into my old bag. There’s also a padded sleeve inside that offers additional cushioning and protection. And oh the compartments! There’s multiple zippered pockets on the front, back and inside to hold anything and everything you need to bring with you like cords, a mouse, power bar, etc. I love all the extra space I have available to me. I’ll be traveling in style when I head to Los Angeles at the end of the month! 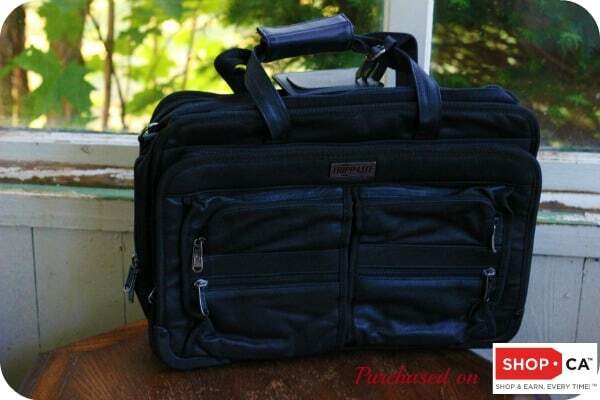 You can buy the Tripp Lite Corporate Top-Load Notebook Case on SHOP.CA for $98.18 with FREE SHIPPING earning yourself $2.46 in SHOP.CA Rewards. I also had my first experience with SHOP.CA Customer Support. They emailed me to let know that there was a delay in the shipment of my order. They apologized and asked if I would like to wait for my order or prefer to cancel. I emailed back and said I didn’t mind waiting. It actually arrived at my door a week later! They were very professional and courteous and I appreciate them following up with me about the status of my order. SHOP.CA has an enormous selection of products and is a site built by Canadians for Canadians and there’s lots of perks to join! Think FREE SHIPPING, NO duties or brokerage fees, returns up to 365 days and being able to SHOP in Canadian funds. Let’s not forget the Rewards you earn when you make a purchase and refer your friends to join. Each $1 in rewards is worth a $1 in Canadian money so its easy to figure out how much you have to spend. Right now when you join SHOP.CA, you will receive $10 in Rewards to use on your first $25 purchase. I encourage you to join SHOP.CA (it’s FREE) if you haven’t yet! What will your first purchase be? I am part of the SHOP.CA Super Shopper program and I receive special perks as part of my affiliation with this group. The opinions on this blog are my own.